If you were ever thinking about booking a Disney Cruise, January to April 2016 might be the perfect time. 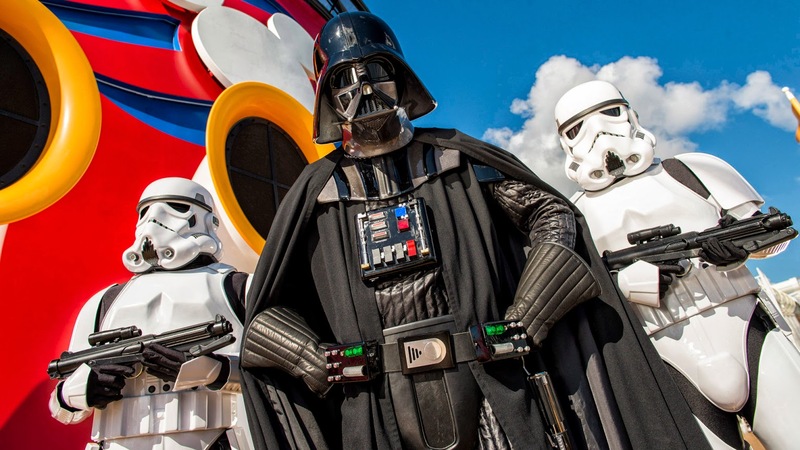 Lucasfilm and Disney announced today a new event that will be taking place on Disney Fantasy cruises in the Western Caribbean, 'Star Wars Day at Sea." This will be a one day event during the cruise where Star Wars takes over all aspects of the cruise, with screenings, costumed characters, events, fireworks, and Star Wars celebrities. Darth Vader, Chewbacca, Boba Fett, stormtroopers, and other characters from across the Star Wars galaxy will be onboard for scheduled meet and greets, as well as roaming on deck and elsewhere around the ship. Guests also are encouraged to dress up in their own stellar costumes. A shipboard version of the popular Jedi Training Academy experience invites young Padawans to learn lightsaber moves from a Jedi Master. They can then use the Force and face off in a final test against the evil Darth Vader. Guests can watch the first six Star Wars films. Also showing will be episodes of the hit animated series Star Wars Rebels. On each of the special sailings, celebrities and insiders from the Star Wars galaxy will share their experiences, meet fans, and sign autographs. There’s intergalactic fun when the Star Wars deck party blasts off to an exciting evening filled with music, dancing, and games. The deck party culminates in a spectacular display of themed pyrotechnics, lighting, sound effects, lasers, and Star Wars. Post by Disney Travel Professionals. This sounds like it will be a lot of fun for anyone who gets to go! It sounds like it will be a one-day, condensed version of the Star Wars Weekends events Disney holds every year at Disney World in Orlando, Florida. More info on Disney cruises can be found here.